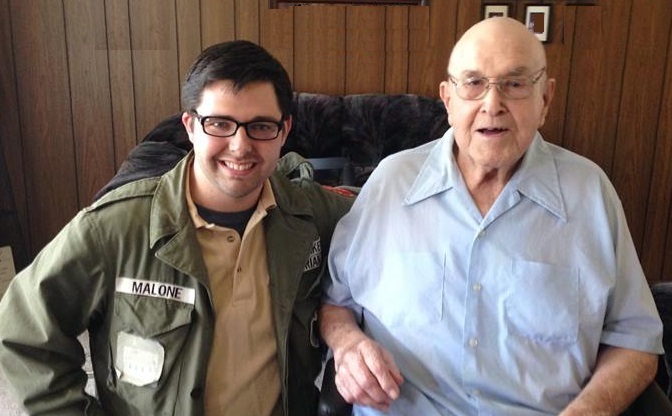 In 2005, I started to interviewing World War Two Veterans. The first man that I interviewed was Robert Bane. Robert was more than willing to tell me about his war experiences, but he had no photographs from his time in the military leaving me to constantly wonder what these people looked like, and this made me start to search for photographs of these men. In 2008, I started to collect the State, County, City, and Unit books that were produced during and shortly after World War Two. These books are by definition rare books, very few were printed, and after more than 70 years even fewer have survived. For this website we take the each book, professional digitize the book at 600 DPI and try to add as much information as possible about each veteran using as many sources as possible. This website is constantly being worked on and I am adding about 300 people every week as well as other context therefore be sure to check back often. My name is Timothy A. Malone, I have been interviewing, researching, and writing about World War Two Veterans for over a decade. I hold a Masters in Library and Information Science, a Bachelors in History and I am serving as the Archivist for the 96th Infantry Division Association. I have been working on building this website since October 2014. Michelle K. Thomas has been working with us since October 2014, as our Community Relations Coordinator Director of Web Design and Social Media Outreach. You see her posts every day on Instagram, Facebook, and Youtube.